When you visit the Isle of Skye, you will definitely notice a fairy theme. The scenery feels like something out of a fairy tale and there are many stories about fairies and the Isle of Skye. One of the most famous being the story of the fairy flag. 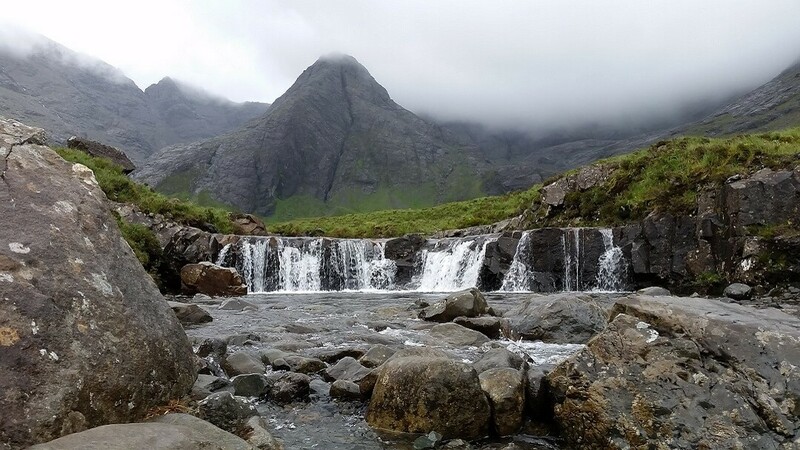 Not surprisingly, the Fairy Pools is one of the most popular attractions on the Isle of Skye. It’s a beautiful area with crystal clear pools and several waterfalls. 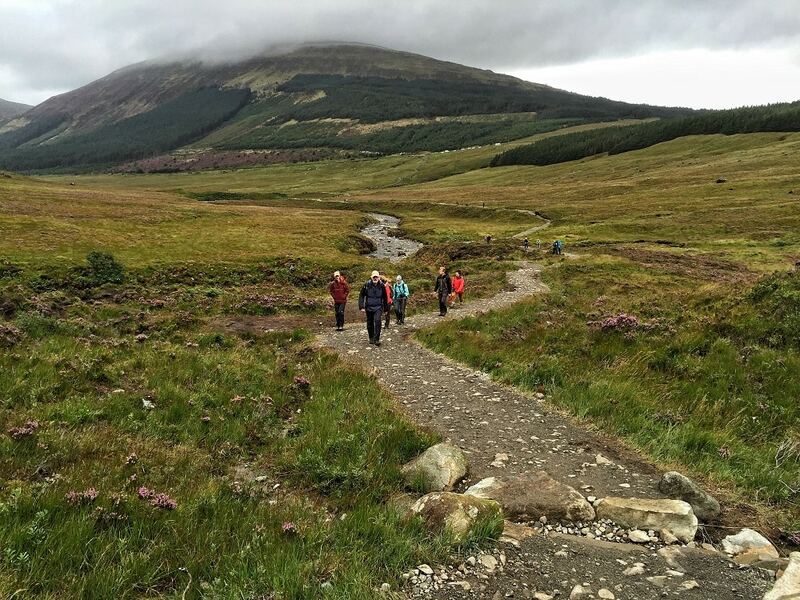 Let me tell you more about the Fairy Pools walk including important logistical information. What are the Fairy Pools? The Fairy Pools are a group of small natural waterfalls in the Glenbrittle area on Isle of Skye. The vivid blues and greens in the water give it a magical appearance. On a sunny day, the water is crystal clear and you can see the moss-covered bottom. No one seems to be sure if the name came from a specific fairy legend or just from the mystical setting. The path is well marked and a pretty easy hike. There aren’t any signs in the parking lot (at least that we saw) saying where to go to get to the Fairy Pools of Skye, but it looked like there was only one trail that started across the street so we went there. The hiking trail is 2.4 km to the Fairy Pools and back. I would classify it more an easy hike (or maybe even a walk), so you can definitely bring the kids along. These tips for hiking with kids will help make it easier. The first part of the hike is downhill. Before long you reach the first waterfall. Russell is a bit obsessed with waterfalls and photographing them, so he wanted to stop. So while he was photographing, I went ahead and it wasn’t long before I saw an even bigger waterfall! 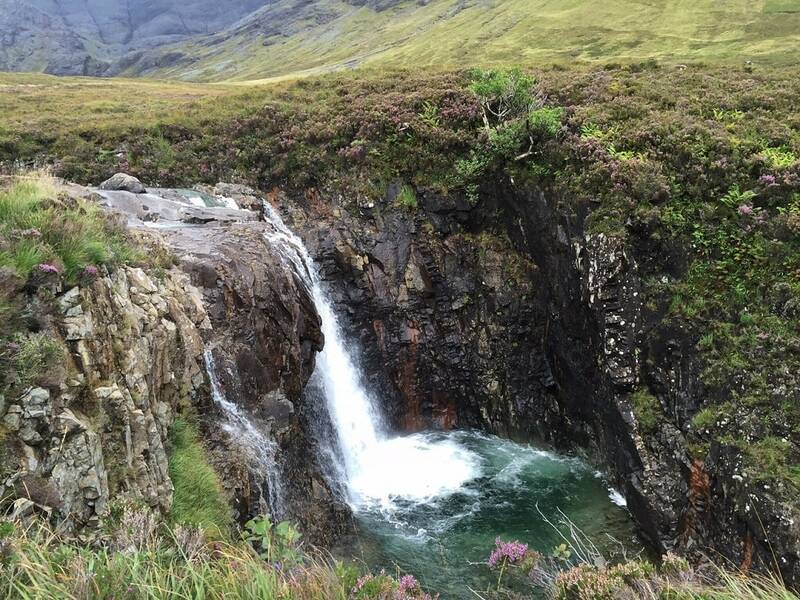 We could not get enough of the waterfalls on the Isle of Skye. Then you need to cross the stream. There are stones for you to step on and it’s not too difficult. Later on, during the hike, you reach another crossing where you have to take pretty big steps to get across. Knowing that the water is pretty cold here, I was a little hesitant but I made it across ok.
Once you get past the second crossing, it is not much longer before you reach the main fairy pool area. We didn’t see anyone swimming but we did see people climbing to get the best angle to take a picture of the largest waterfall. Swimming in the Fairy Pools is allowed but the water is cold even in the summer. If you are thinking about wild swimming, you might want to bring a wetsuit. Whether you chose to swim or just take photos, please be careful! It’s such a nice walk through stunning scenery. So it was raining a little on and off as we hiked to the Fairy Pools, typical Scottish weather. (Check out this Scotland packing list to make sure you will be prepared). I just hoped we would be able to make it back to the car before it started coming down and the trail got muddy. We didn’t want to rush things though because the Fairy Pools are stunning. The water was so clear and I loved the waterfalls. Plus you look into the distance and see the mountains. 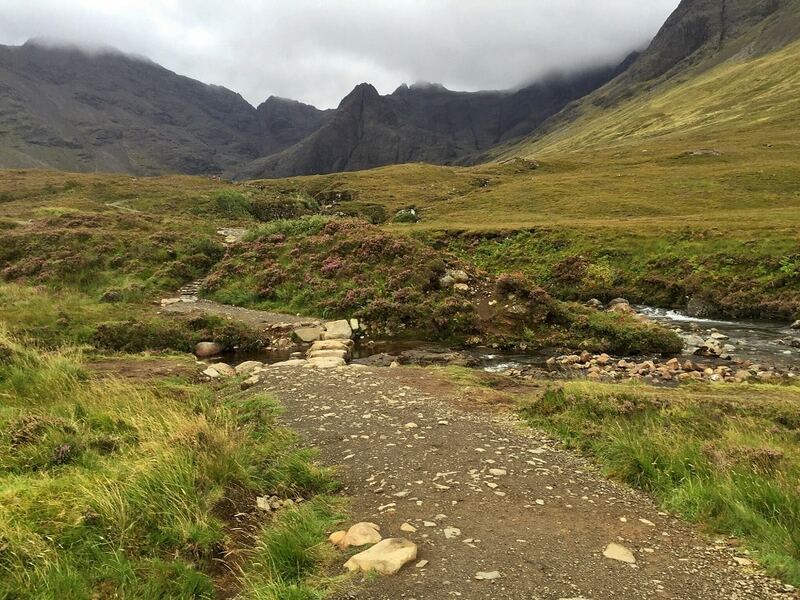 You need to experience the Fairy Pools walk for yourself. The weather may have been disappointing but the Fairy Pools were still beautiful. My one concern was that the rocks on the challenging crossing would get wet and I might slip and fall in the freezing water. Yes, I do worry about these things! There were a few raindrops when we decided to head back but not enough to make the crossing treacherous. Well, that was until two dogs ran in front of me and into the water splashing all over the rocks. Luckily, I did make it across without falling in and we made it back to the car before it started raining too much or the trail got too muddy. Once we got back to the car, we decided to continue on the road we came on to Glen Brittle beach. By the time we got to the beach (15 minutes later), it was raining harder, so we just got out quickly and took a look. It was a nice beach and we would have liked to explore more if the weather would have been better. YOU MIGHT ALSO LIKE: Neist Point Lighthouse: Best Sunset on Isle of Skye? If you are interested in going to a beach, you might also like to check out this list of the best beaches in Scotland. 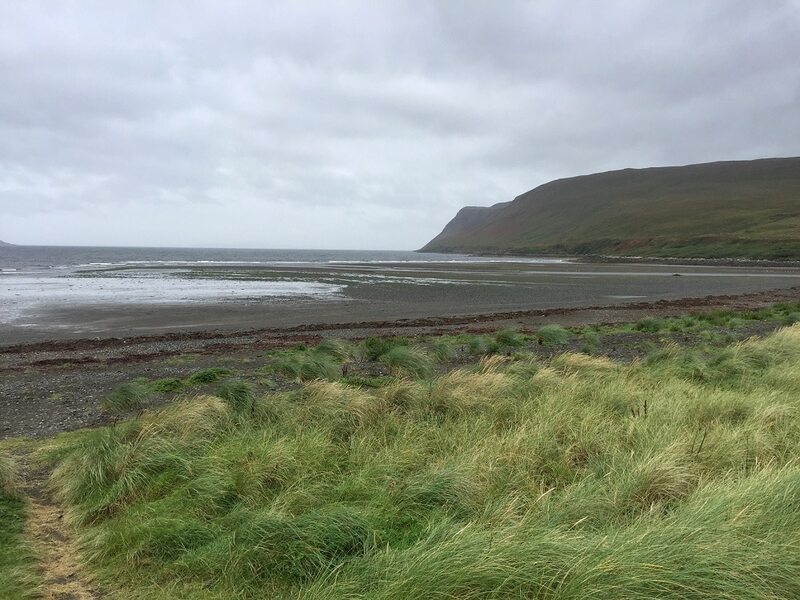 Glenbrittle beach is beautiful, too bad it was raining! We enjoyed our morning at the Fairy Pools in the Cullins. The scenery was absolutely stunning. We loved photographing the waterfalls, but the surrounding mountains are beautiful too. Plus, the hike was pretty easy and it is free! You can get a little glimpse of what our visit to the Glen Brittle Fairy Pools was like in this video. It was a scenic 40-minute drive from the Bed and Breakfast where we were staying to the Fairy Pools. From Portee, it’s a few minutes less. A good portion of the drive was on one lane roads where you have to use the passing places if cars come from the other direction, which is not too unusual when you are doing a UK road trip. You will pass through the Black Cuillins and sections with sheep (or cows) close to or even on the road. Use postcode IV47 8TA in your GPS to navigate to the parking lot. There aren’t any facilities at the Fairy Pools, so you need to be prepared when you visit. It’s not a long or difficult walk but I still think it’s a good idea to bring water. You need to stay hydrated. You should also bring along some snacks if you think you might get hungry. If you want to picnic, bring along a blanket, we didn’t see any tables. Check the weather forecast in advance and dress appropriately. It’s probably smart to bring along rain gear just in case. You will need reasonable shoes for the walk. Something like sneakers should be fine unless it is muddy. If you want to swim, bring towels or maybe a wetsuit. The largest waterfall in the Fairy Pools was pretty impressive. The fairy pools are open 365 days a year. If you can time your visit for a day when the weather is nice that is ideal. I am sure the path can get quite muddy and slippery. Also, try to go to the Fairy Pools first thing in the morning, as it is popular. The parking area is not very big at all and fills up quickly. When we walked back to the car we saw people parked along the road. The road is already narrow enough as it is! From what I have been told, you have a high likelihood of getting a ticket if you park on the street, so please just don’t. 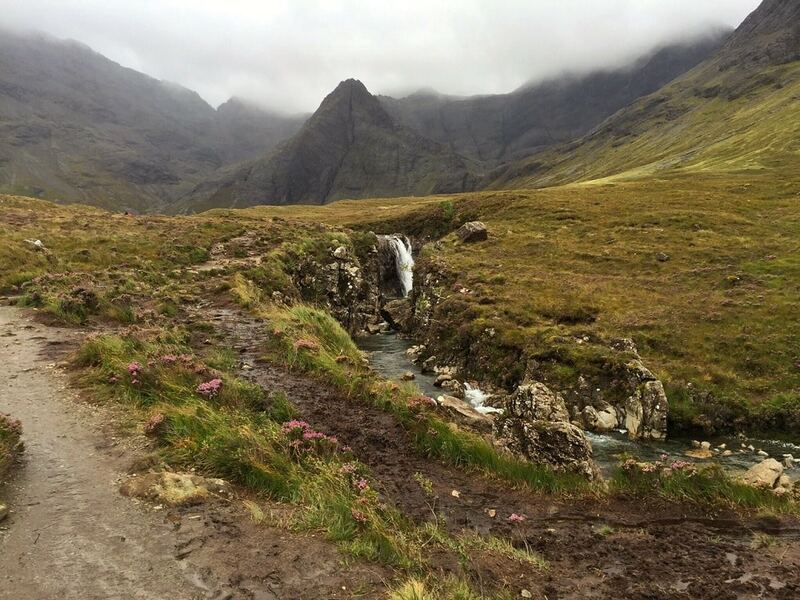 Have you visited the Isle of Skye Fairy Pools or another easy hike that is scenic? I would love to hear about your experience in the comments. Make sure you park in the parking lot and not on the street. I would recommend wearing rain gear as the weather can change pretty quickly. It is free to park and hike the Fairy Pools. The Fairy Pool hike is relatively easy and only 2.4 km round trip. If you just walk it can probably be done in 40 minutes, but you are going to want to stop and take pictures, so allow extra time. There are no facilities at the Fairy Pools. We didn’t even see any picnic tables. NextSan Sebastian’s Monte Urgull is Worth the Hike! Your photos look great! This looks like a great place to visit if I ever visit and great tips. Thanks so much Christine. Its a beautiful spot so I hope you get the chance to go! Thanks Christina. It is a really special place. And really appreciate your positive feedback on the video! Oh my goodness – this is so amazing! I have never even heard of this .. but I just found out I am going to Scotland in January so I just may need to check it out. That is so exciting Nicki! You will love Scotland. I still have a few more posts about my trip coming up. Been to Scotland many of times but never been here, definitely on my list for next time! We just got back from Berlin ourselves. 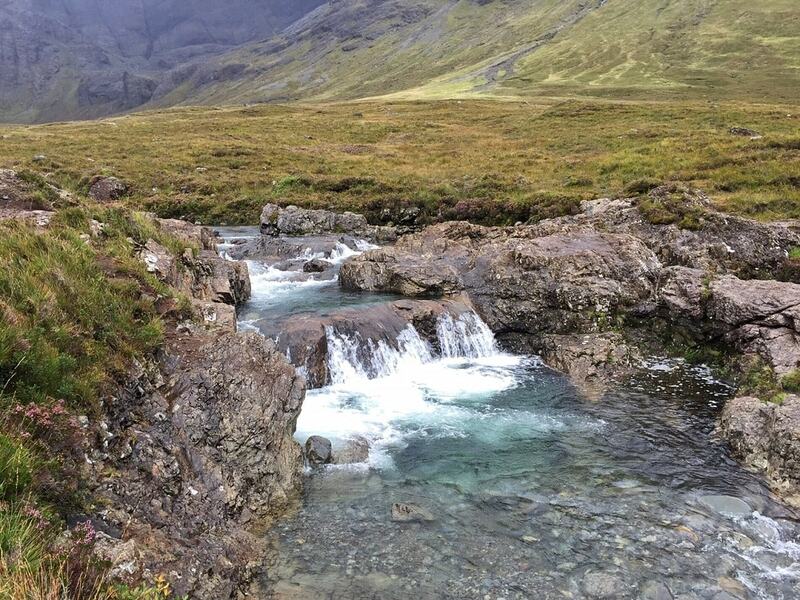 Yes, Isle of Skye and the Fairy Pools are definitely worth a visit, so I hope you make it there on your next trip. Also, I would love for you guys to join the Weekly Postcard linkup which will open on Friday at 3pm EST. You can message us if you have any questions. Thanks Angie. Russell uses the iphone app Cortex Cam and turns off the remove motion blur feature. That keeps everything still apart from the water. And yes I love the fairy vibe! More walks in Skye coming up. Thanks so glad you enjoyed the video. It was worth the walk such a beautiful place! Yes you would love Isle of Skye, its just so beautiful. We were lucky and found some cheap raingear there. Definitely a good tip. I love the scenery surrounding the pools and how green it is. Absolutely beautiful! Have wanted to visit Scotland for a long time and posts like these just reinforces why we need to go soon. Loved the video! Mary – You will love Scotland. It is so green and beautiful and the people are so friendly. There is so much to see, I can wait to go back. So glad to hear you loved the video! Thank you! Thanks Tanja! Hope you get the chance to visit! Irina – You will love Isle of Skye. I also wrote one about Dunvegan castle that you might find helpful. I still have a few more posts about Isle of Skye coming up. Thanks so much, glad you enjoyed it.